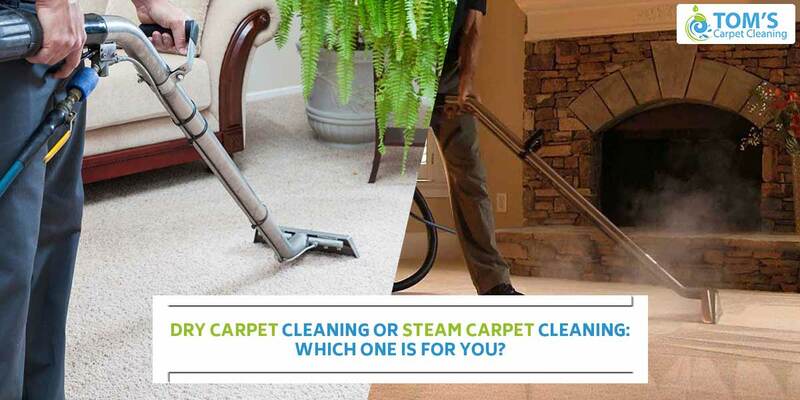 At Toms Carpet Cleaning Services we offer both carpet steam cleaning and dry carpet cleaning, and we are often asked which one is better – Dry Carpet Cleaning or Steam Carpet Cleaning. Along with expert on-site, same-day best in class services we also advise our customers on what kind os carpet cleaning is better: Dry Carpet Cleaning or Steam Carpet Cleaning. Here’s a written guide on what should you choose. The word steam is kind of a misnomer – there is actually no steam involved. In this particular method, heated water is sprayed onto the carpet and then vacuumed up immediately. Carpet steam cleaning method relies on the dirt being suspended by the sprayed water before being extracted. Chemicals along with water are sprayed onto the carpet beforehand to loosen the dirt. Carpet cleaning professionals put these chemicals into the water being sprayed. This according to us is not very apt because the chemicals take time to work. And if they are not flushed out leaving a sticky residue which would attract dirt after the carpet has been cleaned and dried. It can be fairly said that steam cleaning is a more thorough clean and often is recommended carpet manufacturers as the preferred method of cleaning. The primary bane of using this method is that it takes many hours to dry. At times even a few days if a lot of water is used. Also, steam cleaning equipments are heavy, an it gets difficult at times getting the equipment in place, for instances in some high-rise buildings. This method of professional cleaning carpet method is also sometimes called bonnet cleaning. Dry Carpet Cleaning is more of a chemical clean and it gives out only very minimum amount of moisture. In this method, the chemical is sprayed onto the carpet and then scrubbed using a pad. The dust or dirt on your carpet is then lifted directly onto the pads or encapsulated into crystals, crystals formed as the chemicals dry up. These crystals are vacuumed up later. This is good if the carpet is supposed to be used right away or when you want to clean it very lightly. You do not need any heavy equipments for this method. The carpet dry cleaning solution is effective in breaking down oily residue. You can walk on your carpet just after one to two hours after it has been dry cleaned. It leaves the carpet very wet. May take 2 to 4 hours to dry. This method removes stains more effectively than any other cleaning process. Needs to be executed with perfection for desired results. Removes stains if appropriate pre-treatment is done. It helps restore the natural chemical balance of your carpet to give back its natural brightness. Which one will work for you? Let us know at 1300 068 194 we provide on-site, same day carpet cleaning services across Melbourne, Sydney and Brisbane.